Crowds of James Bond fans will be lining up to see Skyfall tonight in glorious IMAX. They'll be watching Bond back behind the wheel of a classic Aston Martin (more money that way). And It's on the occasion of a Bond film we get to nerd-out and talk about the cars. Typically, this means listing our favorite cars from the James Bond canon. BOOOORING. Let's try something else. Let's see if we can name every car from every Bond movie. This includes star cars like the Astons and lesser vehicles. Vehicles that just show up in the background. Delivery trucks. Whatever. Even cars from the books. Drop your contribution in the comments below. Yes, there are sites that talk about the film cars individually, but can we make one giant list of every car in the comments? 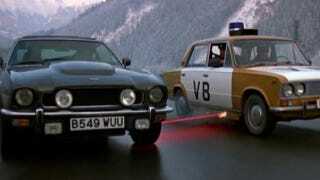 We'll start above with the '86 Aston Martin V8 Vantage and a LADA 1500 from The Living Daylights.